On August 3, 2016, the Rajya Sabha, the upper house of Indian Parliament, finally passed the 122nd Constitutional Amendment Bill for the introduction of the Goods and Services Tax(GST). The passing of the Bill will be looked at as an important achievement for the Modi government. Also, credit must be given to the Modi government for reaching out to the opposition and getting almost everyone on board (excluding the AIADMK party) to get the Bill passed in the Rajya Sabha. To be honest, I didn't think this would happen and which is what I had said in my past pieces. Nevertheless, the Bill could have been passed during the period 2009-2014, if the Bhartiya Janata Party, which is in power right now, hadn't opposed it as vehemently as it did. The television and the print media have gone totally gaga about the whole thing. If you were watching any television channel after the GST Bill was passed on August 3, you would think, looking at the excitement of the anchors, that the Indian per capita income had just crossed that of the United States. a) The Constitutional Amendment Bill will first go back to the Lok Sabha in order to clear the amendments made to it in the Rajya Sabha. The Lok Sabha had earlier passed the Bill in May 2015. This should be fairly straightforward given that the Bhartiya Janata Party led National Democratic Alliance has the required numbers in the lower house of the Indian Parliament. b) After this is done, 15 or more states will have to ratify the Constitutional Amendment Bill. c) Then 29 states and two union territories will have to pass their own GST Bills. d) The Parliament will have to pass the actual GST Act and the interstate GST Act, which will specific the structure of the tax and enable its collection. As of now this seems doable given that the two Acts that need to be passed by the Parliament need a simple majority of more than 50 per cent and not two-thirds majority as was the case with the GST Constitutional Amendment Bill. Nevertheless, this will take time and when things take time, it is always possible that political parties change their mind. Further, the GST Constitutional Amendment Bill will lead to the creation of the GST Council comprising of the finance minister of the union government, who will be its Chairperson, as well as the finance ministers of state governments. The GST Council will essentially go about setting the tax rates. Before we go any further, it is important to understand what GST exactly is, and how will it help improve India's taxation system. India currently has many indirect taxes. Indirect tax is essentially a tax on goods as well as services and not income or profits, for that matter. India currently has a plethora of indirect taxes both at the state government level as well as the union government level. The GST will subsume many of these taxes. It hopes to have one indirect tax for the whole nation and this will convert the country into one unified common market. The GST or value added tax(VAT), as it is known in other parts of the world, is already present in large parts of the world, as can be seen from the following chart. How do things stand in India as of now? Up until now, the Constitution empowers the Union government to levy an excise duty on manufacturing. Let's take the case of a company which manufactures cars. It needs to pay an excise duty to the union government on every car that it manufactures. The current rate of excise duty is 12.5 per cent on small cars. While, the company pays this tax to the government, it ultimately recovers it from the end consumer who buys the car. The union government can also levy a customs duty on exports as well as imports. Further, the constitution allows, the Union government to levy a service tax on the supply of services, which the state governments can't. On the other hand, the State governments are allowed to levy a value added tax(VAT) or a sales tax on the sale of goods. This division has essentially led to a multiplicity of taxes. As the Report of the Select Committee of the Rajya Sabha on the 122nd Amendment Bill of the Indian Constitution presented in July 2015 points out: "This exclusive division of fiscal powers has led to a multiplicity of indirect taxes in the country. In addition, central sales tax (CST) is levied on inter-State sale of goods by the Central Government, but collected and retained by the exporting States. Further, many States levy an entry tax on the entry of goods in local areas." This multiplicity of taxes has led to an inherently complicated indirect tax structure. As the Select Committee Report points out: "Firstly, there is no uniformity of tax rates and structure across States. Secondly, there is cascading of taxes due to 'tax on tax'. No credit of excise duty and service tax paid at the stage of manufacture is available to the traders while paying the State level sales tax or VAT, and vice-versa. Further, no credit of State taxes paid in one State can be availed in other States. Hence, the prices of goods and services get artificially inflated to the extent of this 'tax on tax'." Let's take the case of a dealer in one state buying goods from another state worth Rs 1,00,000. As the goods are moving from one state to another, on this, he has to pay a central sales tax of Rs 2,000 (2 per cent of Rs 1,00,000). His effective purchase price works out to Rs 1,02,000. On this he builds a margin of Rs 8,000 and his sales price works out to Rs 1,10,000. When he sells this good, the state sales tax (or the value added tax) will be charged on Rs 1,10,000. If the tax rate is 5 per cent, then it will work out to Rs 5,500 (5 per cent of Rs 1,10,000). This means that the final price of the good would be Rs 1,15,500 (Rs 1,10,000 + Rs 5,500). In this case, the state sales tax is also being paid on the central sales tax of Rs 2,000 that has already been paid. Central sales tax paid while purchasing goods from one state is not available as an input tax credit while selling the goods in another state. This leads to a cascading effect as tax on tax needs to paid. In this case the cascading effect is Rs 100 (5 per cent of Rs 2,000 of central sale tax). This ultimately gets built into the price of goods, making them more expensive than they should be. The cascading effect and the fact that the indirect taxes already paid in one state cannot be deducted while paying indirect taxes in another state makes many Indian businesses uncompetitive. The Report on the Revenue Neutral Rate and Structure of Rates for the Goods and Services Tax (GST) (or better known as the Arvind Subramanian Committee Report) has an excellent example. As the report points out: "Consider a simple example, where intermediate goods produced in Maharashtra go to Andhra Pradesh for production of a final good which in turn is sold in Tamil Nadu. Effectively, the goods will face an additional tax of 4 per cent, which will reduce the competitiveness of the goods produced in Andhra Pradesh compared with goods that can be imported directly to say Chennai from South and East Asian sources." This basically happens because goods move between states twice and a 2 per cent central sales tax has to be paid each time. As mentioned earlier, tax paid in one state cannot be deducted while paying more indirect taxes in another state. This essentially means that a programme like Make in India cannot take off in many cases. Other than central sales tax, state governments levy entry taxes as well. These can be like octroi in order to fund a local municipal body or otherwise. These taxes are collected while goods are entering the state or a town. This explains to a large extent why trucks in India move as slowly as they do. This essentially drives up logistical costs. As the Subramanian Committee report points out: "One study suggests that, for example, in one day, trucks in India drive just one-third of the distance of trucks in the US (280 kms vs 800 kms). This raises direct costs (wages to drivers, passed on to firms), indirect costs (firms keeping larger inventory), and location choices (locating closer to suppliers/customers instead of lowest-cost location in terms of wages, rent, etc.). Further, only about 40 per cent of the total travel time is spent driving, check points and other official stoppages take up almost one-quarter of total travel time. Eliminating check point delays could keep trucks moving almost 6 hours more per day, equivalent to additional 164 kms per day - pulling India above global average and to the level of Brazil. So, logistics costs (broadly defined, and including firms' estimates of lost sales) are higher than the wage bill or the cost of power, and 3-4 times the international benchmarks. "This will be possible if GST becomes the order of the day. The entry taxes will be subsumed under GST. This will lead to a dismantling of check posts at state borders and there will be no need for trucks to be held up. Around 72 per cent of Indian freight moves through roads. Hence, eliminating check posts will lead to a faster movement of goods through the length and breadth of the country. Crisil Research estimates that "eliminating delays at check posts will yield additional savings of 0.4-0.8% of sales [of companies]." While, the state governments are yet to agree to removal of border check posts, as and when this happens, it will be one of the bigger benefits of the GST. If it doesn't, it will make GST a little less useful. What will GST do about all this? The GST will subsume multiple indirect taxes. Take a look at the following table. It points out the indirect taxes which will come under GST and indirect taxes which won't. While GST plans to subsume many indirect taxes it does leave out several taxes as well. Hence, in that sense GST is not a one nation one tax that it is being made out to be. The GST will take the cascading effect of tax on taxes out of the equation. It will allow input tax credit for indirect taxes that have already been paid irrespective of what kind of indirect taxes have been paid and where they have been paid. There are three levels in the above table- the manufacturer, the wholesaler and the retailer. Let's start with the manufacturer who sells a product for Rs 600 to a wholesaler. He does not purchase any inputs and makes everything in house (I know this is an unrealistic assumption, but it just keeps the Maths a little simple). On this, the manufacturer pays a tax at the rate of 10% which amounts to Rs 60. The wholesaler sells the product for Rs 800. On this he has to pay a tax at the rate of 10 per cent. This amounts to Rs 80, but he also gets credit for Rs 60 indirect tax which the manufacturer has already paid. Hence, his tax outflow amounts to Rs 20. The retailer finally sells the product for Rs 1,200. On this he pays tax at the rate of 10%. This amounts to Rs 120. But he gets credit for Rs 80 (Rs 60 paid by the manufacturer and Rs 20 paid by the wholesaler). Hence, he actually pays a tax of Rs 40. In this way, there is no cascading effect and all the tax that has already been paid is taken into account. What this also tells us is that GST is a destination based tax and will finally accrue to the government once the final customer has bought the good or the service. This explains why parties that rule states like Bihar and Uttar Pradesh have come out in its support. While these states may not have a large industrial base, they do have consumers. The GST has a self-policing feature built into it. As the Subramanian Committee report points out: "To claim input tax credit, each dealer has an incentive to request documentation from the dealer behind him in the value-added/tax chain. Provided, the chain is not broken through wide ranging exemptions, especially on intermediate goods, this self-policing feature can work very powerfully in the GST." As Crisil Research points out: "Since input tax credit will be available for all taxes paid earlier in the value chain, firms would require evidence of compliance from the preceding links to claim set-offs. Thus, they would prefer sourcing inputs from compliant firms. This could increasingly bring unorganised players under the tax net, thereby reducing their price competitiveness vs. organized players." This will be one of the biggest benefits from the GST over the long-term as it will make the entire system more transparent. This could also bring down the price competitiveness of unorganised players as they will have to go legitimate in order to keep their business going. This will increase their costs and could help the more organised players, who already have a strong information technology infrastructure in place. The following table shows the proportion of unorganised players sector wise. But there might be some starting troubles on this front. The onus is on the customer to prove that all the suppliers in the value chain have paid their share of taxes, if he wants to take the input tax credit. This is as per Section 16(11)(c) of the Act. Basically what the section says is that if a supplier has not furnished proper returns or made the correct payment, then the customers of the supplier cannot avail of the input tax credit. And if it has been given, it will be reversed. What will be the rate of tax? This is something that the GST council headed by the finance minister needs to decide on. The Subramanian Committee has basically recommended four rates of taxes. 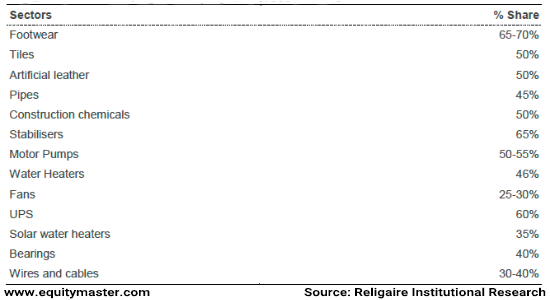 A rate of 2 to 6 per cent for precious metals. A low rate on goods of 12 per cent. A standard rate on goods and services between 16.9 per cent to 18.9 per cent. And a high rate on goods at 40 per cent. It is important that the GST council chooses a reasonable rate of tax. The unweighted OECD average rate for GST was 19.1 per cent in 2014 and 18.7 per cent in 2012. The recommendation of the Subramanian committee of a standard rate of 16.9 per cent to 18.9 per cent is in line with the OECD average. Given the current rate of service tax is 15 per cent (including the cesses), a tax rate of 16.9-18.9 per cent is likely to make services expensive in the short run. This basically means that stuff on which you pay service tax (from your mobile phone bills to your credit card bills) is likely to become more expensive. Crisil Research expects inflation as measured by the consumer price index is likely to go up by 60 basis points in the short-term. This will be in line with global evidence where inflation does go up in the short-term wherever good and services tax is actually implemented. The trouble is that the rate of inflation is already looking up. Also, by the time GST becomes the order of the day, the next Lok Sabha elections will be around one to two years away. Will the government be willing to take on this risk? In the run up to the Lok Sabha elections the rate of inflation as measured by the consumer price index anyway goes up, as the government increases subsidy spends. Why states like the idea of GST? The state governments have come around to the idea of GST primarily because it allows them to tax services, which isn't the case as of now. The GST being adopted has a dual structure with both the union government as well as the state governments levying a GST. Both the central GST and the state GST will be levied on every transaction of supply of goods and services, happening within a state. The taxes will not be levied on exempted goods and services. As Crisil Research points out: "Multiple exemptions exist under the present tax system - the Centre has ~300 items exempted from central excise duty, while the States (together) have ~90 items exempted from VAT. These will be merged into a Final synchronized exemption list under the GST regime." It needs to be mentioned here that longer the list of exempted goods and services, higher the standard rate of GST will have to be. Given this, the government will have to limit exemptions if it wants a proper GST. Other than central and state GST, there will be an interstate GST for transactions happening between states and it will be collected by the union government. The interstate GST will be roughly equal to the central GST plus the state GST. Input tax credit will be available on interstate GST. 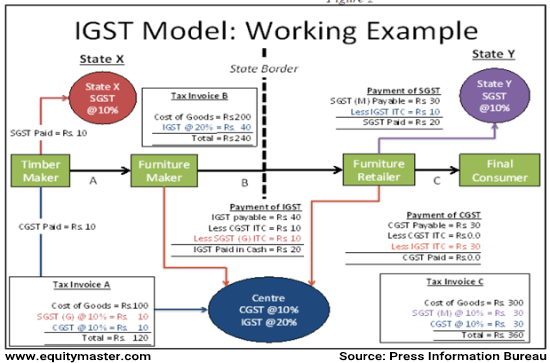 The following chart shows how the interstate GST will work. What are the potential areas of conflict? The former finance minister P Chidambaram of the Congress party has been talking about a standard GST rate of 18 per cent. The Kerala finance minister Thomas Isaac has remarked that capping the 18 per cent rate is too low. Other finance ministers have said the same thing. A report in The Times of India suggests that Isaac has recommended a standard rate of 22-24 per cent, in order to ensure that states do not lose out on revenue. The situation as of now seems to suggest a standard rate of 20 per cent or more, will be arrived at. To this Arvind Subramanian, chief economic adviser to the ministry finance said that a standard rate of "higher than 18-19% will stoke inflation". This is primarily because the tax on services which is currently at 15 per cent will see a huge jump. It remains to be seen what rate the GST council comprising of state finance ministers and the union finance minister come around to. R Jagannathan writing for Firstpost makes this point in the context of small cars. An excise duty of 12.5 per cent is levied on small cars. Then there is the state level sales tax or value added tax of 12.5-14.5 per cent. The union budget this year added a one per cent infrastructure cess on cars. Over and above all this, some cities charge an octroi as well. Hence, we are talking about an effective tax rate of around 28 per cent. If the standard rate of GST is 18-19 per cent then prices of small cars will come down. Crisil Research expects that the prices of small cars to come down by about 10 per cent. But this is assuming that state finance ministers come around to the idea of 18 per cent standard rate of GST. As Jagannathan asks: "Why would any sensible finance minister at Centre or states reduce this to 18 percent?" This will continue to remain a tricky issue given that states need to subsume a whole host of taxes into the GST and are likely to demand (in fact they are already demanding) a standard rate of 20 per cent or more. Also, there is the question of how will states compensate municipal corporations for taxes that are subsumed into the GST. Take the case of octroi. The Brihanmumbai Municipal Corporation makes a lot of money through octroi. If GST were to become the order of the day, the octroi will be subsumed into it. As R Jagannathan writes in a column on Huffington Post India: "The Mumbai Municipal Corporation's Octroi collections annually are in the range of Rs7,000-8,000 crore. Will GST collections in Maharashtra be enough to finance this revenue loss?" This is a question worth asking. Further, the GST system as it has been envisaged will need a solid information technology backbone. This information technology system will essentially lead to a lot of lower level bureaucracy, which runs India's indirect tax system, becoming useless. (Think of all those employees manning check posts on state borders for one). While, the government does not fire employees, a move to GST will lead to the income from corruption for the lower level bureaucracy coming down. And this is unlikely to go down well with them. They, as always, remain in a position to create problems. Also, in a recent interaction with a few economists, I was told that the state level bureaucracy remains unprepared for implementing the GST. The fact that GST is a destination based tax and not an origin based one, which is one of its core points, remains unclear to many of them. For the first five years, the union government will compensate the states for the loss of revenue arising because of GST. This is the known unknown that can really create a problem. If the compensation demands from states are more than what is expected, the fiscal deficit of the central government can shoot up. Fiscal deficit is the difference between what a government earns and what it spends. In this scenario, achieving the fiscal deficit target that finance minister Arun Jaitley has set for the government will become difficult. In the budget speech made in February 2015, Jaitley had said that the government will achieve a fiscal deficit of 3.5% of GDP in 2016-17; and 3% of GDP in 2017-18. Running up a higher fiscal deficit will have its own set of repercussions. As we have already seen GST is basically a self-policing system and makes the entire system more transparent. The Subramanian Committee report points out that the GST "is a stark example of a tax believed to facilitate enforcement through a built-in incentive structure that generates a third party reported paper trail on transactions between firms, which makes it harder to hide the transaction from the government." This basically ensures that the tax collected by the government goes up. As analysts Saurabh Mukherjea, Ritika Mankar Mukherjee and Sumit Shekhar of Ambit Capital point out: "Cross-country evidence suggests that the introduction of GST boosts the tax-to-GDP ratio by 1-2% points." The analysts feel that GST will boost tax collection in India by bringing the unorganised sector which accounts for 59 per cent of India's economy, under the purview of taxation. While the rate of inflation is initially expected to go up, over the longer term, the inflation does come down as the cascading effect of indirect taxes is done away with and the cost of doing business comes down. As the Ambit Cpital analysts point out: "Whilst the introduction of a single GST helped reduce inflation in New Zealand as well as Canada, inflation rose moderately in Australia and Thailand. However, the increase in inflation in Australia as well as Thailand was driven by unique factors such as domestic supply constraints. After adjusting for these factors, inflation in these two countries too was lower post GST implementation." And what about the GDP? The finance minister Arun Jaitley has said in the past that GST is likely to push up the Indian GDP growth by 1 to 2 per cent. "This (GST) has the potential to push India's GDP by one to two per cent," Jaitley had said in April 2015. Jaitley's statement was probably made on the basis of a December 2009 report brought out by National Council of Applied Economic Research(NCAER). In this report NCAER said that other things remaining the same the implementation of GST is likely to push up India's GDP "somewhere within a range of 0.9-1.7%". The evidence on GST increasing GDP growth (or economic growth) is at best sketchy. As the Ambit Capital analysts point out: "Whilst it is difficult to assess the impact of GST on economic growth (as GDP growth is affected by a range of variables), cross-country evidence suggests that there is no clear evidence that the introduction of GST necessarily leads to higher GDP growth. Although the introduction of a single GST limits inefficiencies created by a heterogeneous taxation system, there is little evidence that it helps boost GDP growth rates." To conclude, there are many good things about the GST. Nevertheless, it is not a done deal yet and a few major issues remain, which will continue to test the Modi government in the days to come. Also, it is not the be all and end all, that the media is making it out to be. It is just one of the factors that will set India right in the years to come. Postscript: I will be taking a break from writing the Diary and will be back after August 15. Here is wishing everybody a Happy Independence Day in advance. Equitymaster requests your view! Post a comment on "What Mainstream Media DID NOT TELL YOU About GST". Click here! 17 Responses to "What Mainstream Media DID NOT TELL YOU About GST"
Dear Vivek, There will be inflation is what i predict. Indian commerce is driven by Distributors. Retailers will be forced by this community to increase the prices to absorb the taxes due by them. And the unorganized players remain safeguarded. For the party in ruling this inflation due to price rise will serve as a blessing in disguise due to GDP growth like the fall in crude oil prices which served them initially. Vivek, i will challenge you to do a deeper dive on the subject 'Check posts' and all its related content you have mentioned. This looks to be written by a novice and is far from reality. Thanks Mr.Vivek I don't think better than this no body can explain about GST. Sir, a well written article and clearly explained on the GST aspects. My only worry is that the GST process have to go through various statutory requirements and with States who have probably not still aware of the finer intricacies. Two points which need to be looked into. Since there are some products where the prices may come down, like cars etc, the producers should be on a cap not to increase the prices prior to the implementation. Already a few manufacturers have done so and with the deadline approaching many others will follow suit. Hence the final product may not be of such reduced prices as intended to be. Secondly since the States are given a free hand on state taxes, there will be tendancy of them to increase the rates on such items to unimaginably levels. The sufferer will again be the common man who has to pay from his own pockets and not by freebies by the rich by way of perks.The pensioners of state and centre are covered by price index and get increased pensions. But there are many who have retired from private organisations who do not have any such luxury and are given fixed pensions irrespective of inflation. How do we manage that please? . After reading about the various issues, I am convinced that we have incorporated the solutions which are only going to make things more expensive in our country .We are not serious to look after all our brethren in this country from all segments. Manufacturing is run by great efficiency in the world to give us affordable goods due to economy of scales and technology combined with talent. Countries which adapted these practises are today leaders in this field. Sadly India lacks the where -withal to do original thinking in this country.Sadly prices cannot come down unless parallel economy is tackled with innovative solutions and people friendly policies. This is due to the kind of politics in this country. Since all consumers have to be transparent in paying taxes , similarly all contributions/ donations to political parties should be in public domain with proper third party accounting by independent auditors.This reform would do far more than the GST reform in this country. It also a fact that parallel economy keeps prices of low technology items in check due to competitive pressures, but this is going to change with GST. There was no service tax in this country -(till introduced by the government in last decade )which allowed our IT and Service industry to grow because of lack govt intervention or heavy taxation. After introduction of service tax every activity is being taxed .There are now effort by all politicians to make it upto 18% which is very high. The people who take decisions have never toiled in fields, worked in factories but primarily the only brush they have had with business is as a trader/ broker. Hence the short term lop sided decisions they have always taken . Eventually all taxes make goods and services expensive , especially if exorbitant as is currently the situation. A transactional tax of say 5% on the other hand is better , which taxes all as per their requirements of consumption instead of a high service tax.Ultimately the consumer / people have to pay and higher taxes which leads to non -compliance. We have a large population which would help raising a large revenue due to large transaction volumes instead of increasing taxes to this high level. Business and resources would gravitate due to low taxes, ease of doing business. Hats off Vivek, for clarifying GST in simple way. Thanks for clarifying many issues connected to GST. Very good and informative post, Sir without any bias and sticking to established and evidence based facts. Thank you very much for putting it together in a lucid manner. There is some evidence in the past on how VAT worked in terms of taking input tax credit in India. Some of its characteristics could be attributed to GST as well. We can think of it as a well lubricated system instead of greasing the palms at every check post and point. When all the efficiency as stated comes in, there will be some additional GDP growth as well.